When problems persist for a while, sometimes they start to weigh heavily on the mind. Those little moments of happiness once taken for granted start to seem few and far between. Even though the simple everyday comforts are still there, they don’t get noticed or appreciated as much as they once did. 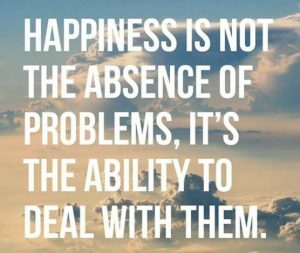 When that happens, it can feel like the only way happiness will ever come back is when the problems go away. Instead of putting most of our energy into problem-solving, it’s often more effective to step back from the worries and set aside more time to enjoy simple comforts that refresh the mind. Just a little shift in perspective can make problems a lot more manageable. Beautiful post Meg! We can’t let the problems take over, they can be big, but there is always a small thing/ moment that brings back the joy. Have a great evening! Thanks Elizabeth, wishing you happy moments too! This goes perfectly with my Hakuna Matata post 🙂 Good quote you posted and good thoughts with it! Very wise words indeed, Meg, thank you! Hi Claire, thanks for stopping by! I try my best to tackle my reactions to problems but some worries are very contagious and get the best of me. Lovely writing! Thanks Karen, yes, worries can be like a contagious virus, and I believe that sometimes they’re best treated the same way, with rest and a bowl of chicken soup! Absolutely a nugget of truth! Thank you for sharing!